The words sape (Société des Ambiançeurs et des Personnes Élégantes) and sapeurs are neologisms that were coined by Congolese diasporic youth living in Western metropolises, especially Paris and Brussels, to authenticate and validate their quest for a new social identity through high fashion. The sape's history, however, dates back to the first years of the colonial encounter in the Congolese capital cities of Kinshasa and Brazzaville. As early as 1910, the sape was in full bloom in Brazzaville, as several observers complainingly noted. In 1913, French Baron Jehan De Witte demurred at what he thought was "overdressing" among the Brazzaville locals: "[…] on Sunday, those that have several pairs of pants, several cardigans, put these clothes on one layer over the other, to flaunt their wealth. Many pride themselves on following Parisian fashion …" (p. 164). In an article arguing that colonial subjects encountered European modernity first through fashion, Phyllis Martin notes that in 1920s Brazzaville "men wore suits and used accessories such as canes, monocles, gloves, and pocketwatches on chains. They formed clubs around their interest in fashion, gathering to drink aperitifs and dance to Cuban and European music played on the phonograph" (p. 407). Most of these young people who prided themselves on being unremitting consumers and fervent connoisseurs of Parisian fashion were domestic servants, civil servants, and musicians. They spent their meager wages to order, through catalogs, the latest fashions from France. The 1950s witnessed the creation of several associations of urban youth, whose main interests seemed to have revolved around sartorial display. Bars had sprouted in every corner of the Congolese twin capitals, owing to the emergence in the 1940s of Congolese popular rumba. These venues provided a natural platform for the youth. Sapeurs in the early 2000s represent at least the third generation of Congolese dandyism. But what sets them apart from their colonial counterparts is their migratory trajectory to European cities and their social dereliction in countries that adopt discriminatory policies toward Third World immigrants. For these young people, the sape therefore becomes a refuge and a vehicle through which to forge new identities away from their chaotic homeland. Before the 1990s, sapeurs living in Paris or elsewhere in Europe were conferred this status only by returning to Kinshasa or Brazzaville during their summer vacation to flaunt their wardrobe. With the two countries in the throes of civil war, and given that many of these youth live in Europe without proper and lawful immigrant documents, they are more reticent to go back home and thus are redefining their relationship to their homeland. The sape thus allows them to avoid the dreadful connivance of Scylla (sojourn) and Charibdis (return). Although confined to the bottom rung of society, these young people are loyal customers of the most prestigious fashion designers of Paris and sport Cerruti or Kenzo suits that can cost as much as $1,000 apiece. 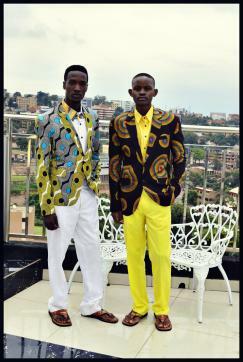 This said, it would be erroneous to define the sape solely as a paradoxical fashion statement. Sapeurs justify some of their deviant (such as loud talking in public places), sometimes delinquent (cheating public transportation) attitudes by arguing that they are making the French and the Belgians pay for colonization (the colonial debt). Sapeurs from Congo-Kinshasa could be said to have reacted against Mobutusese Seko's longtime ban on Western suits (and ties) by adopting a more exuberant form of sape. On the other hand, those from Congo-Brazzaville, predominantly southern Balaris, have used the sape to oppose the northerners (in power since 1969), whom they accuse of squandering the country's wealth by building lavish mansions and buying expensive cars. Indeed, these political attitudes remain inseparable from the hedonistic quest for perfection through fashion and speak to the ways African youth are attempting to negotiate and shape the marginal situation they have been confined to within the global village. See also Sub-Saharan Africa: History of Dress; Paris Fashion. Bazenguissa, Rémy. "'Belles maisons' contre S.A.P.E. : Pratiques de valorisation symbolique au Congo." In état et société dans le Tiers-Monde: de la modernisation à la démocratisation. Edited by Maxime Haubert et al. Paris: Publications de la Sorbonne, 1992, pp. 247-255. -, and Janet MacGaffey. "Vivre et briller à Paris. Des jeunes Congolais et Zaïrois en marge de la légalité Économique," Politique africaine 57 (March 1995): 124-133. -, and Janet MacGaffey. Congo-Paris: Transnational Traders on the Margins of the Law. Bloomington: Indiana University Press, 2000. Friedman, Jonathan. "The Political Economy of Elegance: An African Cult of Beauty." Culture and History 7 (1990): 101-125. Gandoulou, Justin-Daniel. Entre Bacongo et Paris. Paris: Centre Georges Pompidou, 1984. --. Dandies à Bacongo. Le culte de l'Élégance dans la société congolaise contemporaine. Paris: L'Harmattan, 1989. Gondola, Ch. Didier. "Popular Music, Urban Society, and Changing Gender Relations in Kinshasa, Zaire." In Gendered Encounters: Challenging Cultural Boundaries and Social Hierarchies in Africa. Edited by Maria Grosz-Ngaté and Omari H. Kokole. London and New York: Routledge, 1996, pp. 65-84. --. "La contestation politique des jeunes à Kinshasa à travers l'exemple du mouvement 'Kindoubill' (1950-1959)." Brood und Rozen, Tijdschrift voor de Geschiedenis van Sociale Bewegingen 2 (January 1999): 171-183. --. "Dream and Drama: The Search for Elegance among Congolese Youth." African Studies Review 42 (April 1999): 23-48. --. "La sape des mikilistes: théâtre de l'artifice et représentation onirique." Cahiers d'Études africaines 153, no. 39-1 (1999): 13-47. --. "La Sape: Migration, Fashion, and Resistance among Congolese Youth in Paris." Elimu. Newsletter of the University of California, San Diego African and African-American Studies Research Project 4 (Summer/Fall 2000): 4, 12. Phyllis, Martin. "Contesting Clothes in Colonial Brazzaville." Journal of African History 35 (1994): 401-426. --. Leisure and Society in Colonial Brazzaville. Cambridge, New York: Cambridge University Press, 1995. Thomas, Dominic. "Fashion Matters: La Sape and Vestimentary Codes in Transnational Contexts and Urban Diasporas." Francophone Studies: New Landscapes, Modern Language Notes 118 (September 2003): 947-973. Witte, Baron Jehan de. Les deux Congo. Paris: Plon, 1913.